One of the most common problems that you are likely to face with your car is that of a dead battery. More often than not, you may have experienced it when you turn on the ignition and the car refuses to respond. The deafening silence under the hood often indicates that the problem lies with the battery. Under such circumstances, the best way is to jumpstart your car with the help of a good battery and then drive to the nearest garage to get your battery inspected. To get your battery recharged, you will need the help of another car. Call your friends for assistance. In your car kit, you should carry jump starter cables. These cables are essential to connect the batteries and help jump start your vehicle. Follow the instructions provided on the jumper cable manual (if you have a copy). To help you make the right connections, the jumper cables are color coded. Remember to connect the two ends of the red cable to the positive terminal of the good battery and the stalled battery. The black cable end goes to the negative terminal of the good battery, while the other end is to be earthed to your car. Make sure to check the connections properly before you start the good battery. After a few minutes, try starting your car. Jumper cables are an easy and dependable way to help jumpstart your car. Here is a jumpstart car diagram to help you. If you are stranded on a highway or if you are on a long drive, you can keep a jump starter kit in your car. This kit helps you jumpstart your car, even if you do not get any assistance from another car. Basically, a jump starter is a device with a battery that can help get your engine back to life. Nowadays, these devices are easily available in most outlets. Some brands also add accessories to the device, to add to their utility. There can be an optional flashlight to help you see in the dark, or even a tire inflator. Before you buy a jump starter, compare the features and prices online and in stores. Always go for a reliable brand. This is the best way to jumpstart a car without another car. Looking for ways how to jumpstart your car without jumper cables or another car-then read on! If your car has manual transmission and you do not have any cables, helping cars or battery packs with you, then this is an easy way to jumpstart your car. You will need help from a friend or your co-passenger. 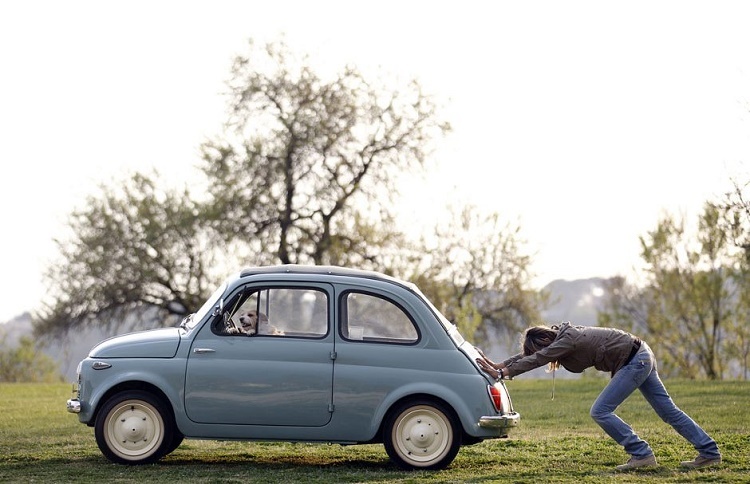 This method relies mostly on muscle power for pushing the car. First of all, make sure you have a clear stretch of a road, preferably a downward slope ahead of you. Push the clutch all the way. Then ask your friend to push the car forward. Change to the first or second gear, while keeping the clutch engaged. When the car gathers momentum, release the clutch with a jerk. The car engine will come to life and you can continue on your way! It is said that prevention is always better than cure! It is always recommended to get your batteries inspected and serviced periodically. However, even if you are faced with a tough situation and your battery lets you down, you should know these easy ways to jumpstart your car!